Janine is the Ghostbusters� receptionist and is played by Annie Potts as a stereotypical curt New Yorker, with a heavy "Brooklyn" accent. She�s normally fairly gracious, but can turn caustic if pushed or stressed. 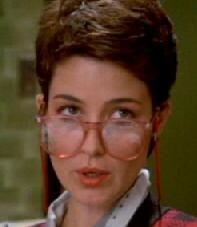 Her character is fleshed out much more in Ghostbusters II where she and Louis begin a romantic relationship. "Yeah, It's a sign alright, we're goin' out of business!" "I've quit better jobs than this!"